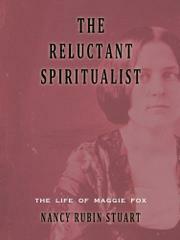 Diligently researched biography of the young woman responsible in the mid-1800s for the growth of spiritualism, sympathetically addressing her ambivalence about the practice and her legacy. Maggie Fox (1833–93) grew up in upstate New York, birthplace of many 19th-century sects. Though Stuart (American Empress, 1995, etc.) capably chronicles this period of religious ferment, she is more concerned with Maggie herself. Fifteen when her family moved from urban Rochester to the small village of Hydesville, Maggie found life in the country boring; the author suggests that this boredom led her and younger sister Katy to create the mysterious knockings and rappings they claimed were messages from the spirits. Soon neighbors were arriving in droves to hear them. Older sister Leah, who had married and remained in Rochester, saw the commercial possibilities and invited Maggie and Katy to stay with her. In the city they acquired a large following, which grew even larger when they appeared in Philadelphia and New York. Befriended by noted journalist Horace Greeley and other distinguished citizens, the sisters became sought-after celebrities. They were dutiful and compliant as their work enriched Leah and the rest of the family, but in 1852 Maggie fell in love with Dr. Elisha Kent Kane, a noted Arctic explorer. He also professed his affection, but begged Maggie to give up spiritualism, which he thought demeaning as well as fraudulent. Stuart vividly details the course of their ill-starred romance; the lawsuits that followed Kane’s death; the consequences of Maggie’s announcement in 1888 that spiritualism was a fraud; and her subsequent addictions to alcohol and opium. Though Maggie recanted her “confession” a year later and resumed holding séances, spiritualism never fully recovered from her initial exposé. Yet its legacy endures, Stuart suggests, reflected in the current interest in New Age and neo-pagan traditions. Lags toward the end, but a persuasive study of an unusual life.